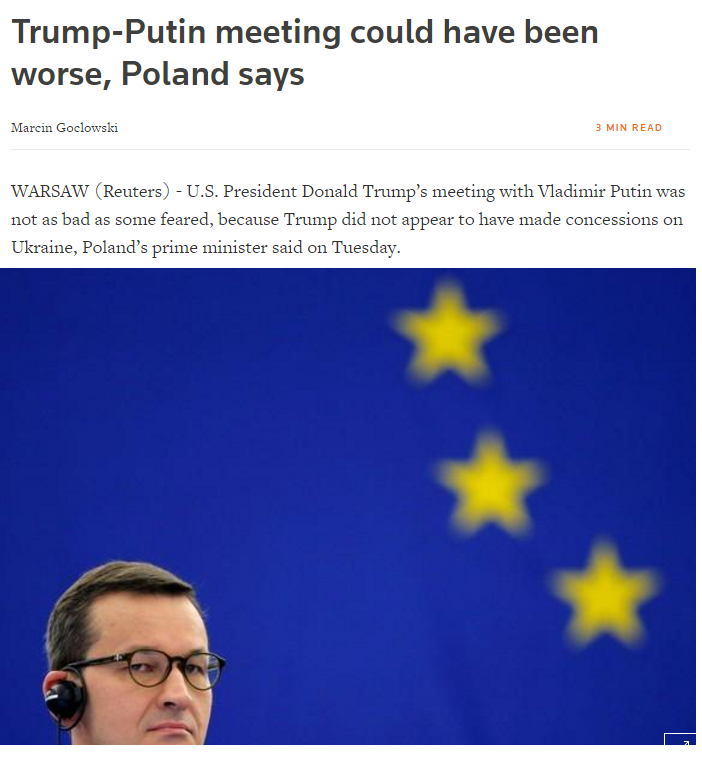 THE AUSER TIMES: Will Polish PM Morawiecki thank me for it !!???? Who is deserved THE most for Trump's NON RECOGNITION OF CRIMEA/DONETSK as part of Russia !!???? Will Polish PM Morawiecki thank me for it !!???? Who is deserved THE most for Trump's NON RECOGNITION OF CRIMEA/DONETSK as part of Russia !!???? Who revealed(the one and only) Putin/Trump's plans ahead of the meeting !!???? Job, however, is far far from over...Ukraine and Poland(along with Slovakia, Czech rep., Slovenia, Croatia, Romania) are made to work with one another...for this matter, laws had to be changed drastically to match those of Poland...NO ANTISEMITISM, NO NAZISM/FASCISM(Ukraine must take drastic step forward in this field as there were traitors in there who collaborated in massacres against Poles in WWII - Ukraine must take initiative and apologize to Poland officially for WWII), NO RACISM OF ANY KIND. He said nothing in public at his summit to criticize Russia over any of the issues - from Syria to Ukraine to the poisoning of a spy in England - that have brought relations between Moscow and the West to their lowest since the Cold War. The friendly meeting was a notable contrast after a NATO summit last week at which Trump berated allies for failing to spend enough on defense, prompting Germany to say Europeans could no longer rely on the White House. “I look at the latest developments, including Helsinki, where it might have been that one president of our neighboring country (Putin) was pressuring the U.S. president for concessions. But I have not seen any concessions, neither as regards the annexation of Crimea nor the war in Ukraine,” Morawiecki said. Before Trump’s meeting with Putin in Helsinki, officials from NATO allies expressed worry that he could offer the Russian leader concessions over Western sanctions related to Ukraine, or over U.S. troop deployments in eastern Europe. Trump unexpectedly canceled military exercises in Korea after meeting North Korean leader Kim Jong Un last month. Poland is the biggest former communist country in both the European Union and NATO, and has called for the alliance to boost its defenses, especially after Russia seized Ukraine’s Crimea peninsula in 2014. Poland has repeatedly requested a permanent U.S. military presence on its soil and has offered up to $2 billion in funding for such a base. U.S. soldiers are now present on its soil through NATO’s back-to-back rotation. Last March, Poland signed its largest arms deal ever, agreeing with the United States to buy Raytheon Co’s Patriot missile defense system for $4.75 billion. Its plan to boost air defenses is aimed at deterring Russia, which has long opposed the formerly-communist countries’ integration with NATO.